The concept of the cloud is nothing new, but our current technology and bandwidth have finally caught up with our ideas, making the concept of the cloud a reality, and making it a viable option. The cloud presents a remote, scalable computing resource accessible via a network rather than a local computer, but it presents two questions; does it benefit digital signage? And if so, how can it benefit digital signage? Cost Reduction is the primary benefit that comes to mind when considering the cloud. Simply put, cloud computing is paid in increments in a pay-as-you-go fashion. As a result, the need for up-front cash to purchase expensive servers is eliminated, and this means that for most digital signage networks, “the cloud” method has some advantages. Using a SaaS (software as a service) model for digital signage allows for lower information technology costs, increased economies of scale, and payment is required on an as-used basis only. In the absence of a SaaS solution, you and you alone are responsible for purchasing and maintaining servers, housing them securely, and installing and maintaining the software. This would often require the full-time efforts of reliable IT personnel–a cost that most would rather spend on the “core competencies” of their business. In addition, when service fees are charged on a metered basis, it means you only pay for what you use, saving you valuable resources in the long run. Finally, cloud computing means you benefit from multi-tenancy. Multi-tenancy is the use of many different applications from multiple clients being used on the same unit of software. Accordingly, efficiency is the name of the game when it comes to cloud computing. The second factor in cloud computing is that it allows for scalable network growth. For instance, as your network grows your space on “the cloud” can grow accordingly. Scalable network growth can be crucial for smaller advertising networks to grow on an as-needed basis. 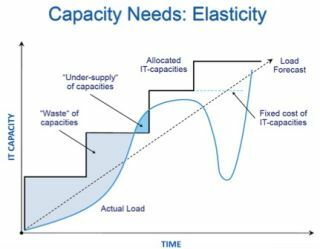 As hardware is incrementally added to the cloud, the server usage can be readily enlarged so that throughput under an increased load does not slow or otherwise decrease server efficiency. Signage companies can store and schedule much more data on “the cloud” than most individual server networks could otherwise. This may seem somewhat obvious, but is vastly important when we start talking copious amounts of HD video that could be housed for deployment to your network. With helpful tools such as file-recognition software and role-based administration, you can also more easily ensure that redundant data is avoided. This again increases efficiency and even more server capacity. One of the benefits that can be realized from deploying cloud computing is an increase in innovation. When server updates are not a chief concern of network operations personnel, innovation in other areas can become a primary focus. It’s a simple issue of core competency: “If I focus my time on my core competencies and you focus your time on those things you do best, the community as a whole benefits.” No longer does the organization have to spend time working on a server, scrambling for updates and working on maintenance. That is taken care of by the cloud managers, allowing for more innovation within your own organization. Keep in mind, this not only applies to innovation, but also to the other workings of your enterprise. Freeing time otherwise spent on digital sign server maintenance to focus on what you do best, could increase your productivity and profits across the board. Ease of implementation is also a strong benefit in deploying the cloud. Without the need to purchase hardware, software licenses or implementation services, a company can get its cloud-computing arrangement off the ground in record time — for less than the cost of an on-premise solution. A majority of the cost of digital signage servers is the initial purchase and implementation fees. Such fees can often be substantial in purchasing servers, cabling, and implementation of a large server facility. Let’s round off the positive factors of the cloud with security. Security in general can be a point of liability when using the cloud, but it can also be beneficial. Having all the information on the cloud reduces the need for redundant security testing at multiple sites, cutting the overall cost of security testing for passwords, and cracking substantially. Second, having all your data in one central location reduces data leaks and losses. Instead of caching data on various smaller devices, where data control and disk encryption standards often aren’t enough, you can rest more easily with the data on the cloud. Redundant server farms for hosting large and small digital signage networks, complete with role-based administrative access will truly provide ease of use for large and small networks alike, giving more opportunities for growth and expansion for others wishing to start their own digital signage network. But the cloud is not without its challenges. The cloud model has been criticized by privacy advocates for the greater ease in which the companies hosting the cloud can control and monitor, lawfully or unlawfully, the communication and data stored between the user and the host company. Instances such as the secret NSA program, working with AT&T, and Verizon, which recorded over 10 million phone calls between American citizens, causes uncertainty among privacy advocates, and the greater powers it gives to telecommunication companies to monitor user activity. Cloud computing poses privacy concerns because the service provider may access the data that is on the cloud at any point in time. They could accidentally or deliberately alter or even delete some data. Using a cloud service can complicate privacy of data because of the extent to which virtualization for cloud processing (virtual machines) and cloud storage are used to implement cloud service. The point is that in cloud operations, customer or tenant data may not remain on the same system, or in the same data center or even within the same provider's cloud. As can be expected with any revolutionary change in the landscape of global computing, certain legal issues arise; everything from trademark infringement, security concerns to the sharing of proprietary data resources. Data location and jurisdiction are also key issues facing a cloud based system. Some users require that data be housed in a specific location for security and accountability purposes (such as medical or defense contractors). Where the data is located, can change the laws that it is subject to, and who can gain access to the information through legal means (such as a subpoena). Different types of data may be subject to compliance with legal standards such as HIPAA, and may require certification and processes that are not possible in a standard cloud architecture. As cloud computing is increasing in popularity, several issues with the security of cloud systems have arisen. The first is one of data access. In order to access an on premise system, a hacker must have either physical access to the hardware, or penetrate the network through a secured Internet access port. In a cloud system, data is being transported over channels across the Internet, opening greater opportunity for encryption to be cracked, and data stolen. The second issue is scale. For an individual, it is unlikely you will attract criminal attention simply to steal your data; it represents a large amount of work and risk, with little payoff. As the cloud aggregates many company’s data into a single center, it presents a much more tempting target. Consider Sony’s PlayStation network fiasco from 2011, where millions of user’s passwords and credit card information were stolen in a security breach. As someone who lost their credit card to the Sony fiasco, and had to go through fraud issues, I have a healthy respect for the problems that cloud computing can cause in the world as a whole. Speaking as a die-hard digital signage proponent, however, I think we can all agree that the cloud does indeed represent a strong benefit for those wanting to deploy a digital signage network, especially the smaller networks that make up the majority of all networks in the US. The cloud can bring lower costs, better economies of scale, easier deployment, and more secure systems, allowing digital signage to exist in places it may not have otherwise. I’m of the mind that anything that helps our industry grow and prosper is a good thing, and if a well applied cloud solution brings digital signage implementation into the reach of more people, I’m all for it. Jonathan Brawn, CTS, DSCE, DSDE, DSNE, ISF-C (jonathan@brawnconsulting.com) is co-principal of Brawn Consulting LLC, an audio visual and IT consulting, educational development, and market intelligence firm with national exposure to major manufacturers, distributors, and integrators in the industry.